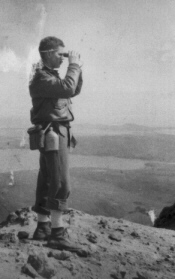 Leonard Feinberg Where the Williwaw Blows is based on Feinberg’s two-year stint (1944-45) as a naval officer on the island of Adak in the Aleutians. In this darkly humorous novel, Feinberg turns a sardonic eye on the foibles of military life while he memorializes the quiet heroism of some of the men who were stationed on one of the bleakest military outposts of World War II. Published by: Pilgrims' Process, Inc.
08-27-42 Wm R. Eubank Lt. M.C. 404thB. Sqdn Surgeon Enroute from WillRogers Field, Okla to Camp Murry, Wash.
Dr. Will R. Eubank MD served in the United States Army in the Air Corps as Aviation Medical Doctor in the 404 Bomber Squadron during World War II. Part of this service was in Alaska - primarily in the Aleutians, with 12 months service on Adak and Shemya. Father told us about his experiences in Alaska, in a very positive way. There were stories about the rugged snow capped mountains and fields of wild flowers. 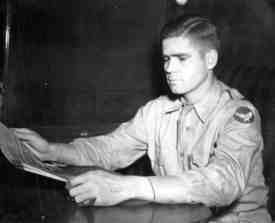 He talked about the miles of beach that he walked and his flights a medical officer in B-17s & B-24s in bombing raids flown over the Rat Islands and Kiska. Some of his photos are found here - he took quite a few during the time on Adak - and some on Shemya and in Anchorage when he was there to pick up supplies or on R&R. There are pages about the typical Aleutian military camps - the 404th staff, Umnak & Adak mess halls, Adak 404th dispensary, Adak living quarters, recreation, freetime, the U.S.O. party, bombing raids over Kiska, APO 729 , Shemya 36th Dispensary, and on alert - going home . A map of Alaska and the Aleutian area is found here. I have included every scrap of information from the backs of the photos - names, rank, home city, dates. . . Many pictures were not identified - and many had the stamp of the camp inspector. On October 10, 1999 a list of specific links to World War II in the Aleutians was added. Jeffery Earl contacted me in March 2007 about doing some research on his relative Clifford Smith. We put the material up and within one month he had two emails that directly related to his research. The web is very powerful. Among his possessions was a "Yearbook" from the time period called "We Were There" which was dedicated to the original members of the 404th Bomb Squadron. Included now on the site is the cover and inside page of the book along with two new pictures of Dr. Will R. Eubank - his bomber crew and his medical squad. Rationing on the Home Front, has proved to be a very interesting topic. Many children and grandchildren of the World War II generation are finding war rationing books in attics and closets as they clean out their relatives homes. Here are some of the books and such information as I can find. All the pictures are small by todays standards - and many were certainly developed and printed where ever Father was stationed. The first of his letters included is dated September 1942 and tells about his trip to Alaska on a troop transport up the inside passage. His letter of October 6/10, 1942 tells about his first trip to Adak. Father's actual notes are in RED (next to the photos) and my added comments are in black. I have probably misread his hand writing on some names. In his letters, the parts dealing specifically with Alaska / military service / the war, are in BLUE and the information about friends and relatives is in black. Plane & men against the weather. Our pride & joy - a flush toilet - Spring '43. Did his stories have an influence on us . . . his children, grandchildren and greatgrandchildren have lived in Alaska from 1968 to the present. Please check out the work of J. Anderson Luster, military artist, diorama and model builder. 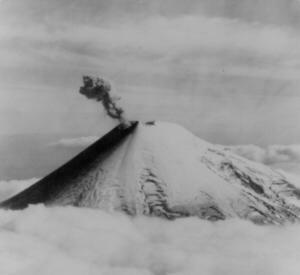 Volcanos and their evidence are scattered all along the "Rim of Fire" which circles the Pacific Ocean. While in Belkofski we lived about 25 miles from Pavlof Volcano - scientists friends dubbed it the "November Volcano" due to eruptions during that time of year. During our time in Sand Point (1973 - 1988) sulfurous gas and ash visited that community several times. I was stationed on Shemya between Oct. 43 and Dec. 45. My duties most of that time took place in the harbor area as Supply Tec 4 of the Harborcraft Detachment of the Transportation Corp. My responsibilities were to service the needs of our small outfit of 65 men as well as supplies needed by Army Tug Boats. Seeking inforkmation on Clifford Smith, radioman, killed in action over Paramushiru on 9/11/43. Does anyone know Herman H. Simmons of the Army 7th Division Ordnance Department that was in the Aleutians in 1944? The Aleutian Peninsula and Islands are very active and many of Father's pictures show mountains and volcanos. I have been working on this site since May of 1998 - (it is now May of 2001) and I have learned a great deal about my Father during this time - about what he and others went through for four years - about his sense of humor - about the things he learned in living and working in the Aleutians. and the retaking of Kiska Island. Taken by Maj Caster M.C. Semisopochnoi Volcano Aleutian Islands 1943. Several other "Sons/Daughters of Aleutian Soldiers" have contacted me since this site was put up. The nephew of Robert Lee Schulze has asked for help in finding out about his uncle's service in the 404th. Jeff Marksbury has provided an image of the 404th BS Insignia. Also, Alan R. Broadbent of West Melbourne, FL has sent a series of photos of his dad, Joseph William Broadbent Jr. PBY Pilot, who was on Adak and Amchitka in 1945 and 1946. Karen Konsdorf-Stephens has contacted me with pictures of her father - Henry Konsdorf who served from June 26, 1941 to Oct.12,1945. He was from Detroit, Michigan. We will be putting up some of his pictures and would like some help on identification (since very little information is on any of the pictures.) 02/12/2001 Tammy Mattics has sent pictures of her uncle Sergeant Vernon Ellis and his plane "Iggy" #31 - does anyone know about him? 02/09/2006 Dr. James H. Canavan has sent a picture of his brother 1st Lt. George J. Canavan who served in B-24s as a co-pilot during late 1943 - early 1944 with a request for information. Kodiak - Womans Bay - Long Island - Fort Tidball - Pink Elephant Mystery?? 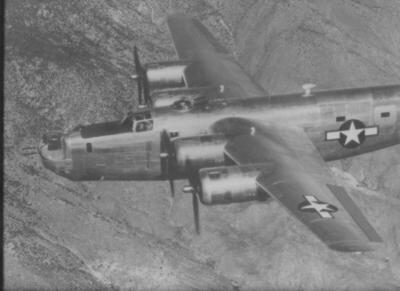 Want to join the B-24 Web Ring? Special thanks to Internet B-24 Veterans Group For the Pictures.